Happy 2019! Our 16th Year! 2019 is going to be a great year! We are excited to start our 16th year of Law Enforcement training. When Tim Lewis began this adventure, he created a new style of training, pulling from his years of athletics and law enforcement experience. This includes hands-on training in the field. It’s been very successful and we are grateful to God and all the agencies who have made it possible to bring what we love doing best to your departments. 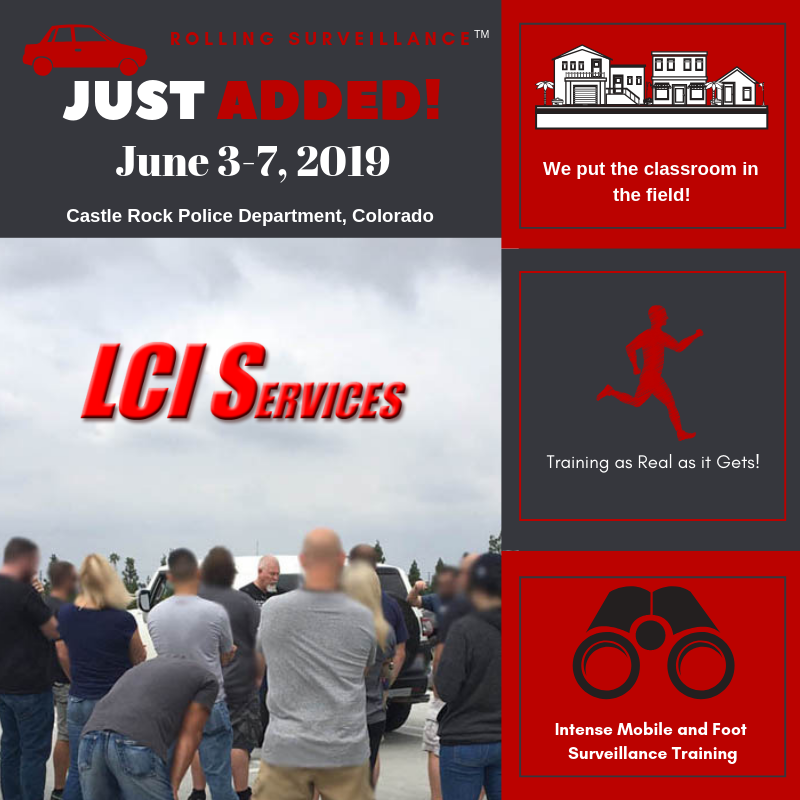 We teach officers, investigators, specialized units, and task force members creative techniques to increase their safety and success while conducting criminal investigations. We hope to see many of you this year. Some of our classes are already filled and closed or are almost there. Be sure to register your team or yourself for upcoming classes to make 2019 your best year to date in your law enforcement career. Hello! I’m Giulianna, the assistant here at LCI Services Law Enforcement Training. I bring you some great news. Our 2019 schedule is posted! For 16 years we have been bringing you the best law enforcement training in the subjects we cover. We take the classroom out into the field for realistic scenarios and hands-on training. We are already receiving online registrations for next year. As you know, the class sizes are limited to maintain quality training in the field. If you have plans to bring your team to training, I suggest you begin making plans now. Register today! And don’t forget, if you pay early, you receive a discount. We look forward to training with you. It’s going to be amazing and intense. Our best year yet! Setting up a storefront operation, location, administrative issues, bringing in business, operating time, function, goals and objectives of the storefront, safety, collection of evidence, organizing the operation and productivity, working as an undercover officer (team), cover team, surveillance team and shutting it down with arrests to prosecution. The beginning stages, vision, and the development of major vehicle theft case Investigation from beginning to end. Organizing a complex case for easy understanding, filing and prosecution, Importance of Identifying the criminal group structure and operational activity, various investigative tools, direction, important resources and intelligence, dealing with the roadblocks that will arise, collecting evidence to support charges, conducting surveillance and special operations as well as when to shut it down. There will be major case studies presented by various detectives/investigators. Developing and managing informants, contracts and agreements, safety issues when utilizing an informant while working in the field with criminal individuals and groups. Special considerations with prosecutors view of utilizing informant and court testimony. Happy Boss Day, Mr. Lewis! I’m Giulianna, one of the assistants as LCI Services. Today, is Boss’s Day in the United States. It seems like as fitting of a time as any to thank Mr. Lewis for being an exceptional boss! Those of us who are blessed to work Mr. Lewis know that he is a boss with integrity. He encourages each of us to be our best. He leads by example. And he has more energy than a room full of toddlers after eating cookies. Sometimes he’s tough. Sometimes he has to correct us. Sometimes he asks us to go out of our comfort zones. I suppose for the others who are/were cops this is nothing new, but for me…let’s just say, it is shaping me. I doubt anybody really knows how much work Mr. Lewis puts into this company. I would venture to guess that about 350 days a year he works to make LCI Services a success. He is often working from sun-up to late at night, with an occasional nap (you’re allowed to get away with that after you turn fifty). Why does he work so hard when he’s already a successful boss? Because he doesn’t believe mediocre is good enough. He genuinely loves what he does and wants to make sure every attendee is getting the best training. His passion is evident in the classroom/field when he’s instructing and role-playing. He believes in always giving 100%. So what does he do those other 15 days? He’s hiking or painting. I don’t think he knows how to sit still, except when his age periodically forces him to slow down for a day or two. Mr. Lewis, we are grateful for your dedication and leadership. May you have a very Happy Boss Day!